HD Receiver Direct Satellite TV Tuner Connect to the future of digital TV, Whether we like it or not, digital video connection is the way of the future. Consensus of the producers to grow shows that consumers who have HD-capable displays that only have analog (Y/Pb/Pr or RGB) high definition connections won’t be left out in the cold, which is good news. However, while Hollywood may allow legacy equipment to remain in satellite tv services, they prefer the potential copyright protection that’s available through digital signals. We enthusiasts like the opportunity to pass digital signals directly to the display without stopping along the way for an unnecessary conversion back to an analog signal. Finally, several manufacturers have come out with new HD capable tuner to accommodate the growing number of displays with digital connections. Sony, Zenith, and Samsung are a few of the first manufacturers to introduce HD DBS receiver that are outfitted with a DVI connection that has HDCP (high bandwidth digital content protection). These tuners can connect to the new crop of HD capable displays that have the same input. The DVI interface allows the satellite tv tuner to uncompress the compressed high-def signal and send it, along with the tuner’s interactive onscreen graphic, to the digital display while it’s still in digital form. The only drawback is that the signal’s wide bandwidth makes it impossible for you to use any known consumer or professional recording device to make even an authorized recording. None of these tuners offers an IEEE 1394 connection, which would pass along a compressed digital signal that you can then record on a video hard drive, a D VHS player, or an HD DVD like device. All three tuners offer a complete suite of the necessary inputs and outputs. 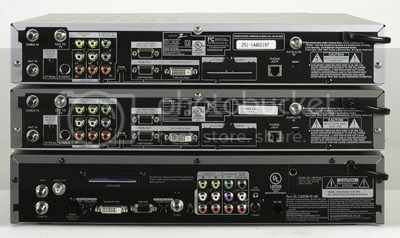 The Sony SAT-HD200 and Zenith HD-SAT520 are nearly identical; both are built around the same LG (Lucky Goldstar, Zenith’s parent company) chassis and therefore have the same connections. I’ll refer to them as one unit, except where there are noted differences. Although it has similar outputs, the Samsung SIR-TS160 tuner, sourced from Hughes, has a different back-panel arrangement. We didn’t have a Hughes unit on hand for direct comparison. All three tuners offer two basic A/V outputs, an S-video connection, component (Y/Pb/Pr) and RGB connections, a DVI jack, an RF-modulated output, digital audio, and other typical satellite connections. Sony and Zenith use an optical digital audio output, while Samsung offers a coaxial digital connection. All three tuners include a switch that activates either the Y/Pb/Pr output or both the RGB and DVI outputs, but not all three outputs at once. Like many HD DBS receiver, the Sony and Zenith tuners force you to choose either the standard (composite or S-video) or high-def (Y/Pb/Pr or RGB and DVI) output. You can’t send the DVI signal to your home theater HD monitor and the composite signal to the NTSC set in your bedroom at the same time. 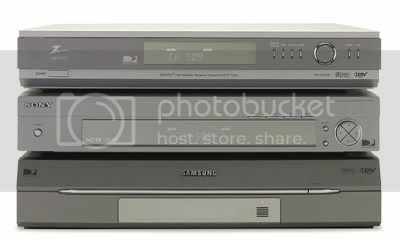 The Samsung receiver, however, does and will always output a 480i signal from the composite and S-video outputs, which makes it extremely flexible for multiroom viewing (make sure that the displays all have the same aspect ratio) or for use with a standalone TiVo or ReplayTV hard drive recorder. The process of selecting the type of output is considerably different between boxes. With the Sony and Zenith models, you use a button on the front panel to select your output options. Sony adds this function to the remote for convenience. The Samsung tuner’s only option is another back-panel switch that offers 1080i, 720p, or 480p/480i options. The switch’s location makes any kind of native output impossible but also keeps curious fingers from changing the setting. Depending on which mode you pick, the receiver up- or down converts all signals to that output rate and activates the appropriate connectors. While this is simple and entirely appropriate for the vast majority of displays, the Sony and Zenith models add four additional output options, including native, hybrid 1, hybrid 2, and EZ DVI. The native setting converts 480i signals to 480p and passes along 720p and 1080i signals directly to the display without conversion. The hybrid 1 and 2 settings are similar, but hybrid 1 converts all HD signals to 1080i, and hybrid 2 converts them to 720p. EZ DVI automatically detects the monitor type and converts all signals accordingly. Enthusiasts with multiscan displays (read: CRT projectors) may appreciate these tuner’ added flexibility. All three units’ ergonomics are effective and intuitive, but the Sony and Zenith units have a slight edge. All of the remote controls are reasonably well laid out and provide proper controls within single-digit reach. Menu structures are attractive and reasonably intuitive.All three tuners eliminate my pet peeve about first-generation set-top boxes: They list analog and digital off-air broadcasts and Direct Satellite TV channel in the same channel list. No more switching inputs. The Sony and Zenith models benefit from a front-panel display that indicates the current format setting and channel number, which is extremely handy. Samsung’s front panel has nothing more than a hard-to-see red light to let you know that it’s on. The latter tuner does add features like a Biorhythm chart and simple video games for kids. I’m not sure why you’d need a Biorhythm chart, but the games are mildly amusing when there’s nothing worth watching on TV, which is a common occurrence. All three tuner allow you to select your display’s aspect ratio and modify formats that don’t otherwise fit. However, while each tuner strips gray bars into the unused space beside 4:3 images on a 16:9 screen (to prevent uneven phosphor wear on CRT or plasma displays), only the Sony and Zenith units provide a setting that eliminates the bars permanently. These two tuners also satellite tv offers an on screen feature that indicates when a particular satellite program is broadcast in true high definition. This indicator didn’t light up when I watched Joe Somebody on HBO’s HDTV channel. Presumably,HBO upconverted the program before they broadcasted it, but you could have fooled me. The major differences between the Zenith and Sony tuners lie with the remote controls, although Sony does include a free DVI cable (worth $20). Sony’s remote, as I mentioned, can change the output-format option on the fly. You may not need this function beyond initial setup, though. You can also code the remote for a particular receiver, if you have more than one. Unfortunately, none of the remotes provides discrete power-on and off commands or aspect-ratio settings, which might make it difficult to program a macro-based remote control like the Philips Pronto or an automation system from Crestron or AMX. I connected each box’s component high-def output to an Extron switcher, which was connected to our reference Runco DTV-991 CRT projector. According to signals from our HD test generator, the DTV-991 is capable of a full 1,920:1080i resolution. I made direct comparisons of the tuners’ signals by switching inputs and comparing the image quality. All three tuners looked excellent. The Samsung’s picture was slightly more flushed than that of the other two tuners and seemed to make colors bloom somewhat. The Sony and Zenith tuners, which created identical pictures, provided a slightly sharper picture than the Samsung. This perceived detail may be due to the fact that these tuners have less color. Unfortunately, we have no way to know which box is accurate, although I’d venture to guess that all three tuners hover on either side of the line. In most cases, you can adjust the color level to some extent through your display. When I used each tuner’s with the Sharp XV-Z10000U projector, I noticed a slight increase in detail and clarity over the analog connection. Differences between tuners were even more difficult to see. Comparing analog audio levels is considerably more difficult without a reference level, and comparing digital outputs is harder still. If you use an HDTV tuner, you should use the digital output, in which case your external audio processor will mostly determine the audio quality. If you’re using the analog audio outputs (get with the times), all I can say is that the Sony and Zenith models are a hair louder. Tired of my current, first-generation RCA DTC-100 and its particular ergonomic hang-ups, I’m eager to get a new HD-capable tuner. I’m torn, however, between the options presented here. Samsung’s dual-output capability, which will feed both my main system’s HD-capable projector and its peripheral devices (VCR, PVR, etc.) and a second display, is enticing. For those people who don’t have a CRT projector, this is a good fit. For those who do, the Sony or Zenith tuner native outputs might be more useful, and these tuners’ ergonomic features are an excellent bonus.As the tuners’ street prices are likely to be very similar, choosing one over the other will depend on availability and brand preference.